I arrived back in Fairbanks this afternoon and after a few quick errands, I started to get the rig ready for the Memorial Day road trip. Bridget and I are riding down to Talkeetna for the annual Alaska Sidecar camp out. We are leaving around 3 pm with Jed and his shiny Ural. Last September, I had picked up this 60mm ammo can at the Palmer fair with the intention of mounting it under the back of the sidecar. Procrastinator that I am, I finally installed it. 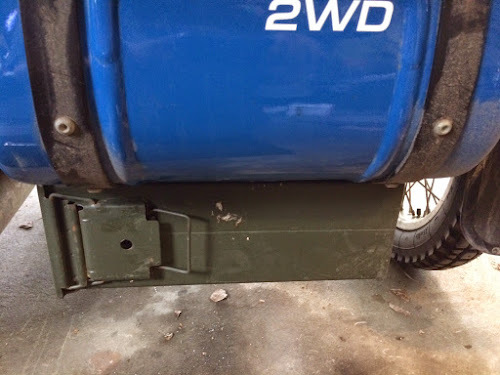 I used 4 3/8" bolts with fender washers inside the sidecar and inside the ammo can and 1/4" thick rubber washers between the box and the bottom of the sidecar. It opens towards the bike and there is plenty of room to completely open the door. Later, I'll put on a small padlock to keep honest people honest. For now, I have the scissors jack, the spare tube, a quart of oil, funnel, and a small rachet set in there. There's room for more but that's probably enough weight. I had mentioned that the one thing I miss on the Ural is a clock. 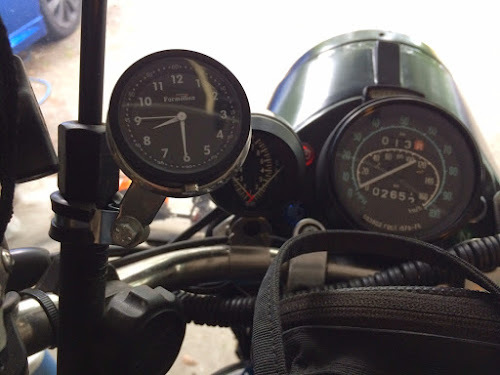 This afternoon, Jed stopped by and dropped off a motorcycle clock that he had lying around. It's just what I was looking for. So now the rig has quite a load with two camp chairs, a three person tent, two sleeping bags, two thermorest pads, stove (actually 2 stoves), cooking stuff, two breakfasts, one dinner and some snacks. Plus the normal camping gear, insect repellant and a couple of changes of clothes. I checked the sidecar alignment since one of the lower clamp bolts was loose but it is still right at ¼" toe in and 1° lean out. The new gas cap came in and it is now tethered to the bike. I still haven't decided whether to put the duffle on the rear of the bike or on the rack. The lower ground clearance due to the added storage could be an issue with road debris, no? The box sits higher than the frame and driveshaft of the sidecar. You can't really tell from the angle of the picture but it's over a foot from the box to the ground. Let's see a pic of the loaded up rig! I like the storage ammo box and as I've a similar arrangement, can tell you ground clearance wasn't an issue in Moab. I'll have pictures of the loaded rig in the next post. I liked the idea of getting some of the less used items out of the trunk. The dry, lockable storage is important for some stuff. It sounds like everything has come together well. I have the same question as David: Are you at all worried about the reduced clearance? Not really, Charlie6 and others with similar storage boxes take their rigs on roads and trails much rougher than anything I'll ever encounter without issue. Road trip!! Have fun and take a lot of pictures. Will do. It's about 270 miles to Talkeetna and I will take plenty of pictures. Finally. Ready and packed to leave, and Bridget goes Monkey? Good stuff! Looking forward to your road trip report. And pictures please...? This trip is sort of a test. If she doesn't mind the ride, then she may meet me for part of my trip this summer. It's a reasonable distance to try things out. Talkeetna is about 300 miles south of Fairbanks on the Susitna River. Pretty touristy town. I'm looking forward to photos, also! Take care and have a great time! Getting Bridget in the sidecar for a long trip sounds like a fine trip. When you post of the experience you'll have to interview her for candid thoughts on the trip -- not just your biased assessments of it! Getting spouses involved in riding is a tricky business. Me reporting a biased assessment! I'll try to get some quotable quotes.